To make the dipping sauce: In a mixing bowl, combine the Sriracha sauce with the Mexican crema, the Maggi sauce and the sweetened condensed milk until fully mixed. To make the chicken: Place 1 chicken breast at a time in between 2 sheets of parchment paper or plastic wrap and pound with a meat mallet or skillet, or roll with rolling pin, to flatten. In a medium-to-large bowl, beat together the eggs and milk. In another bowl or on a plate, combine the panko breadcrumbs, amaranth seeds and salt. Submerge each chicken breast in the egg mixture, then coat it on both sides, pressing slightly, with the panko-amaranth mixture so the whole breast is covered. Set aside on a cutting board or baking sheet. If making ahead, layer sheets of plastic wrap or parchment paper between the prepared breasts, wrap tightly, and refrigerate or freeze. Pour enough oil into a large skillet to reach 1/4-inch up the sides. Heat the oil over medium heat for about 2 to 3 minutes until it is hot but not smoking, then place as many chicken breasts as will fit in a single layer without crowding the pan. If the edges aren’t bubbling in the oil, raise the heat to medium-high. Resist the urge to move the breasts around in the pan, as this my cause the amaranth coating to fall off. Cook for 2 to 3 minutes on one side until golden brown, then gently flip and repeat on the other side. When the second side has crisped, remove the breasts from the pan and set them on a paper-towel-covered plate or wire rack. Repeat with remaining chicken pieces, adding more oil if needed. If you’re not eating immediately, place the fried chicken breasts in a baking dish and keep them warm in a 250°F oven. Serve with the dipping sauce. 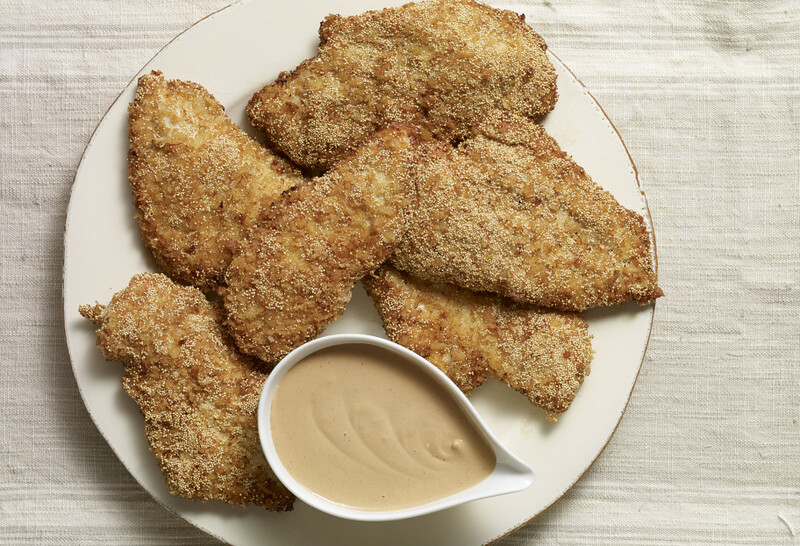 It’s amazing how I’ve never heard of amaranth seeds before until I saw this episode, but I absolutely love Panko-crusted chicken and I cook it whenever I can for weekend lunch! Now I have a new way to try out my original recipe 😉 Quick question though. So I’ve done the original egg-breadcrumb technique for my Panko chicken, but I sometimes I like to instead soak the chicken in buttermilk for an hour and then coat it in the Panko. Would this technique work here too? Thank you, as always, for sharing your fantastic dishes Pati! Give it a go, Carlos, and let me know how it goes. We made the Amaranth Panko Chicken for dinner — whoa, FANTASTIC!! Muchas gracias, Pati! For alegrías do you have to puff or pop the amaranth before making them? Hi Pati, how else can you use Amaranth seeds? One of my favorite ways is to make Alegrias, which is like a brittle, but instead of made with nuts, made with amaranth. But you can also use as a garnish, for salads, tacos, ice cream, almost anything! We just saw the episode on Canadian TV and looked up this recipe. The first thing that grabbed me was the excellent photograph. The composition of the subject matter and the quality of the photograph is tremendous. Compliments to photographer. We will try to locate some amaranth and make this dish. Thanks Pati for introducing us to new (to us) ingredients. Thanks, Ross! Penny de los Santos is the photographer, and she is really fabulous. Hope you like the dish when you try it, amaranth is so charming. what is sriracha sauce? how or were in the grocery store do I find amararth seeds? Hi Jana, Sriracha is an Asian hot chile sauce: http://www.amazon.com/Huy-Fong-Sriracha-Chili-Bottle/dp/B0002PSOJW. I usually find amaranth seeds in Latin markets, the bulk section of Whole Foods or other health food stores. Love, love, love your show. You are so refreshing and your food is delicious. Have your first cookbook. Is there a second on the way? Hi Kat, Thank you!! Happy birthday to your husband!